Considered the most important mineral in the body, after oxygen, water and basic food, it may be the most important element needed by our bodies. The 11th most abundant element by mass in the human body; its ions are essential to all living cells, they play a major role in manipulating the most vital biological compounds such as DNA, RNA, ATP (energy) DHEA for hormonal balance. 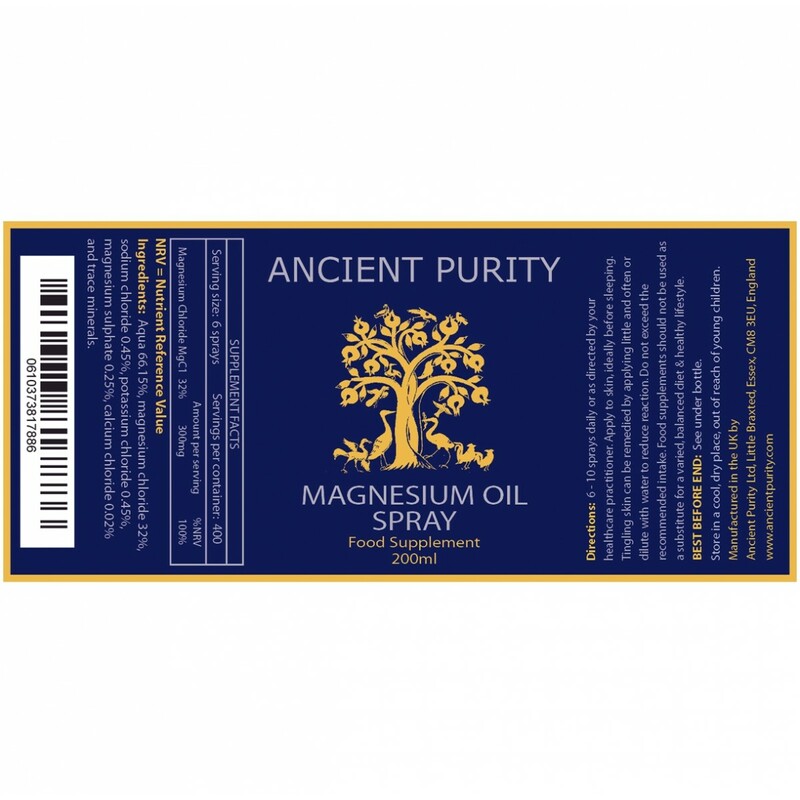 Ancient Purity Magnesium Oil, is pure, highly concentrated, magnesium chloride with other trace minerals. 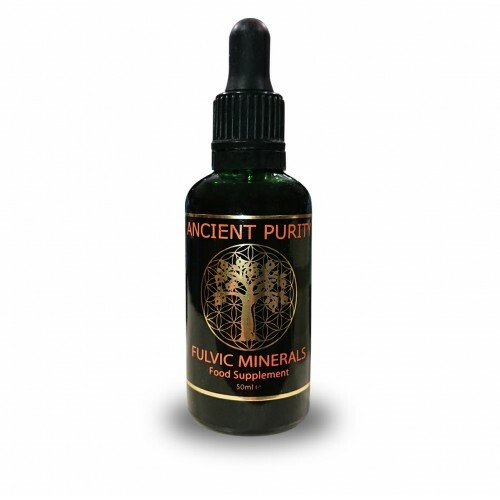 It is sourced from the Ancient Zechstein Seabed in Northern Europe. We add nothing and take nothing out. Hundreds of enzymes require magnesium ions to function. In fact, it's required for more than 325 enzymatic reactions, including those involved in the synthesis of fat, protein and nucleic acids, neurological activity, muscular contraction and relaxation, cardiac activity and bone metabolism. Few people are aware of the enormous role magnesium plays in our bodies. 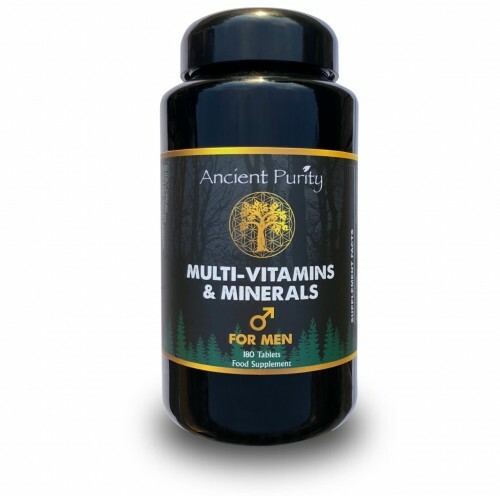 Deficiency may be responsible for more health problems than any other nutrient. Lack of Magnesium at a cellular level can lead to the deterioration of your cellular metabolic and mitochondrial function, this can lead to more serious health problems. Magnesium chloride, sprayed on the skin or added to a bath is an ideal form of easily assimilable magnesium. One can also spray 1 to 3 sprays in a large glass of water along with a pinch of bicarb and a drop in fulvic minerals to obtain a superbly balanced glass of water. Helps create overall good health. Promotes restful Sleep & Relaxation. A U.S gov study on dietary habits estimated that 68% of the population is Magnesium deficient, or will become deficient. The UK recommended intake for Magnesium (the daily amount deemed adequate to prevent deficiencies in 97.5% of the UK population) is set at 300mgs for men and 270mgs for women. 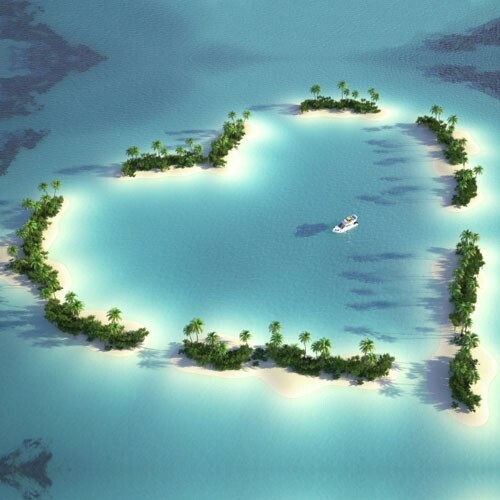 Many people needlessly suffer from a lack of health and suffering because they do not get enough. Insulin is enhanced by magnesium and in fact, you can't transfer glucose into cells without magnesium. Magnesium deficiency can lead to fatigue. The biggest problem of all that is brought about by magnesium deficiency is muscle cramps and if you have connected the dots then you will know muscle cramp in the heart is not good. Possible Signs of Deficiencies: Muscle cramps, spasms, twitches or tremors. Regular or excessive fatigue. Feelings of irritability and or lethargy. Frequent mood swings, including depression, anxiety and panic attacks. Pre-menstrual bloating and cramping. Restless legs, seizures, hiccups, pins and needles in extremities, abnormal heart rhythm, the feeling of a lump in the throat. Dizziness, insomnia, nervous system disorders. Is your Heart is crying out for Magnesium? 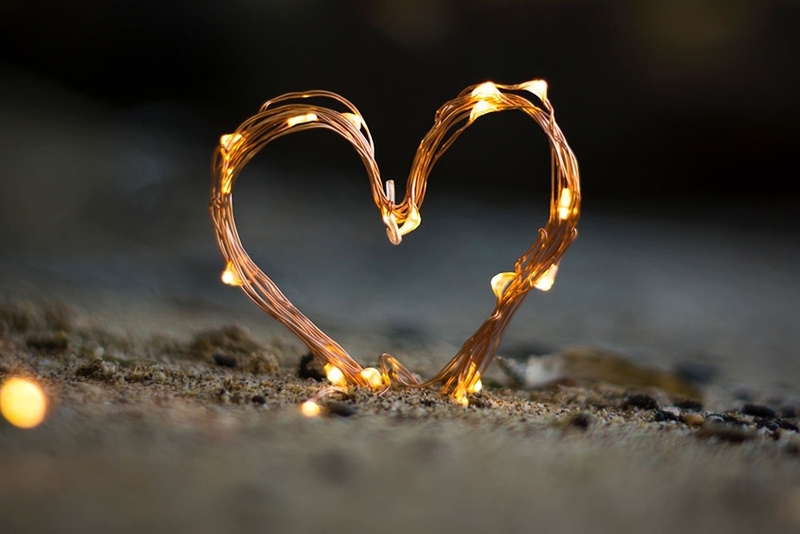 Scientific evidence suggests Magnesium plays a crucial role in supporting your heart. We must get the correct balance between Magnesium and Calcium, so few people get enough Magnesium in their diet, while Calcium tends to be overused and taken in high quantities. As mentioned already lack of Magnesium tends to trigger muscle spasms, and this has consequences for your heart in particular. This is especially true if you also have excessive calcium (this causes muscle contractions). Dr Carolyn Dean, the author of "The Magnesium Miracle," says your heart has the highest magnesium requirement of any organ, specifically your left ventricle. With insufficient amounts of magnesium, your heart simply cannot function properly. Hypertension (high blood pressure), cardiac arrhythmia, cardiovascular disease (CVD) and sudden cardiac death are all potential effects of magnesium deficiency and/or a lopsided magnesium to calcium ratio. Magnesium is the mineral that allows your body to relax, aids sleep. The master mineral that makes the others work properly. The most important mineral missing in modern food. Called the miracle mineral and the beauty mineral by the Chinese, Magnesium is the key mineral for good health and is required daily. Incredibly, in Japan, only 10% of women experience hot flushes during menopause. In Europe, that figure is far higher coming up towards 80%. The Japanese consume a very large amount of seaweed which is very high in both magnesium and iodine. It's a good idea to take B vitamins particularly B6 when using magnesium. These can be found in brewers yeast and in really high-quality multi-mineral/multivitamins. According to a systematic review and meta-analysis published in 2013, "circulating and dietary Magnesium are inversely associated with CVD risk." This means the lower your magnesium intake (and the lower the circulating magnesium in your body), the higher your risk for CVD. Each 0.2 millimoles per litre (mmol/L) of circulating magnesium was associated with a 30% lower risk of CVD. 200 milligram per day (mg/d) increase in dietary magnesium was associated with a 22% lower risk of fatal ischemic heart disease (IHD) but had no significant impact on CVD risk. The inverse association between dietary magnesium intake and IHD also leveled out above 250 mg/d. The authors noted their finding "supports the need for clinical trials to evaluate the potential role of magnesium in the prevention of CVD and IHD." The Weston A. Price Foundation has also noted that: Magnesium shines brightest in cardiovascular health. It alone can fulfill the role of many common cardiac medications: magnesium inhibits blood clots (like aspirin), thins the blood (like Coumadin), blocks calcium uptake (like calcium channel-blocking drugs such as Procardia) and relaxes blood vessels (like ACE inhibitors such as Vasotec)". With a decent workout, you could require 10–20% extra Magnesium compared to resting. Magnesium helps move blood sugar into your muscles and dispose of lactic acid, which can build up in muscles during exercise and cause pain. Studies have shown that supplementing with it can boost exercise performance for athletes, the elderly and people with chronic disease. One study showed volleyball players who took 250 mg of magnesium per day experienced improvements in jumping and arm movements. Another study, athletes who supplemented with Magnesium for 4 weeks had faster running, cycling and swimming times during a triathlon. They also experienced reductions in insulin and stress hormone levels. Magnesium also functions as an electrolyte, which is crucial for all electrical activity in your body. Without electrolytes such as magnesium, potassium and sodium, electrical signals cannot be sent or received, and without these signals, your heart cannot pump blood and your brain cannot function properly. The magnesium we used to get in food tends now to be missing as a result of modern agriculture and more and more people are suffering from the symptoms of this crime against humanity. A soil deficiency of magnesium will lead to magnesium-deficient plants, animals and humans. It has been known since the 1930s that a diet low in magnesium leads to serious illness. In fact, French research done in the 1930s proved beyond doubt that the level of serious disease in Europe at that time was 10 times the level experienced by people living in Egypt which had a high magnesium content in its soil and therefore its food. If an Egyptian moved to Europe or the US, within a few years of eating the European or US diet they would experience the rate of a serious illness 10 times that found in Egypt. 10 Sprays Daily. (Magnesium experts often recommend 20 sprays or more daily). Best applied to torso late in the evening shortly before sleeping and after showering ideally. Children: Reduce dose according to body weight. Safe to use during pregnancy. Oral Care:1 spray in mouth while brushing. Note: Magnesium may sting slightly, as your levels restore the sting with reduce, however, if you spray onto an area of skin that is not sensitive you should find it comfortable. Warning: Avoid contact with eyes! Do not spray on open wounds or cuts, broken skin - due to sting. Origin: Zeachstein Sea bed (North Sea). Q - My skin tingles when I apply Magnesium, is there something wrong? A - If you are Magnesium deficient you may feel a tingle or slight itch upon application of Magnesium. This is normal and is actually a sign of Magnesium deficiency. The tingling will reduce as you continue to use Magnesium. If you experience any pain then you should rinse the area where you have applied magnesium. It is possible to dilute the magnesium with mineral water to create a weaker solution. Q - Do I need to shower or rinse the magnesium off after using it? A - Rinsing off magnesium oil or magnesium gel after use is a matter of personal preference, and depends on how much you apply and where it is applied to the body. Typically, the more magnesium oil or gel used per application, the higher the likelihood you may prefer to rinse it off. In roughly 20 minutes your skin can take full advantage of topically applied magnesium, and it may be safely removed at that point. 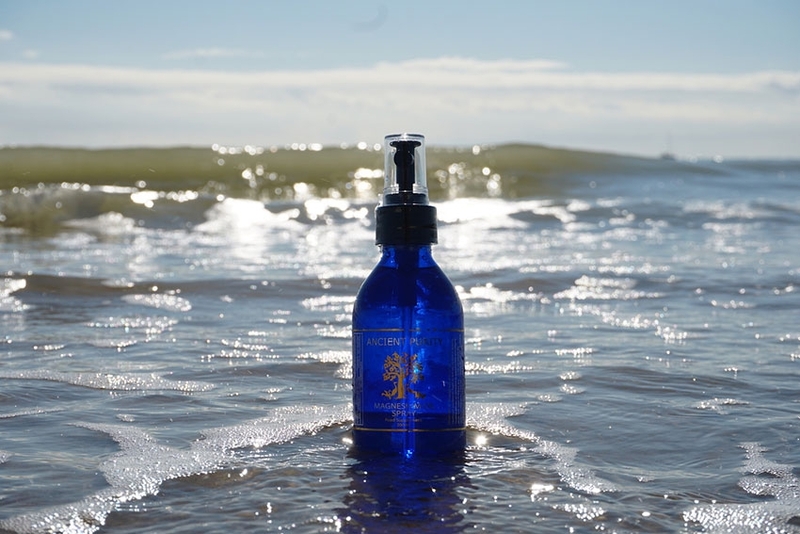 Q - Why can topical applications of magnesium chloride be so healing? A - Topical magnesium is healing by way of the skin, a living, breathing organ with tremendous potential for re-mineralizing the body. The skin has the ability to absorb substances that are then carried by the circulatory system around the body. Our Magnesium penetrates the cells with dramatic results on cell biochemistry, and are inexpensive, safe, and convenient. Q - Is there a maximum daily limit for using Magnesium topically? A - No. The skin has a unique ability to self-regulate absorption, and therefore overuse is of little concern. Q - Will magnesium applied topically produce a laxative effect like oral magnesium supplements? A -No, there is little to no potential for a laxative effect. This is a fundamental advantage of using magnesium products topically, as your skin can naturally self-regulate the absorption of minerals. Q - Are there circumstances where I shouldn't use Magnesium Spray? A - Those with poor renal function should consult a health practitioner before use. Q - Are there any other precautions to take while using Magnesium? A - Avoid using Magnesium Spray near mucous membranes such as the eyes and nose, which can cause some irritation. In addition, though applying the Magnesium Spray to broken skin or wounds can be highly therapeutic and cleansing, the high concentration of magnesium salts may cause discomfort. If you are using Magnesium on broken skin or lesions (i.e. psoriasis, eczema, acne, etc.) it is strongly advised to begin with a Magnesium Bath Pack until the skin had a chance to start healing and become less sensitive to the higher concentration of magnesium chloride in the oil and gel. 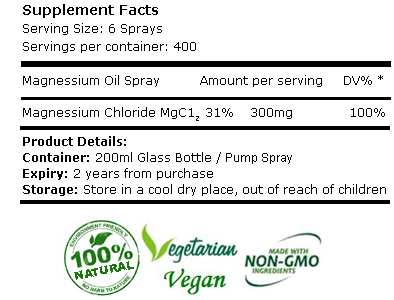 Q - I am on medication, is Magnesium Oil suitable for me? A - Yes, magnesium is a natural substance and present within all of us. Certain medication can inhibit the uptake and utilisation from our diet. If at all unsure contact your healthcare practitioner. Q - Are Magnesium products safe to use with children? A - Yes, Magnesium baths are the preferred application by most parents, and have been used with great success on children as young as 6 months old. They are not only safe but also highly therapeutic and can calm restless children. Q - Where does your Magnesium come from? A - Northern Europe nearly 2 miles beneath the surface referred to as the Ancient Zechstein Sea. 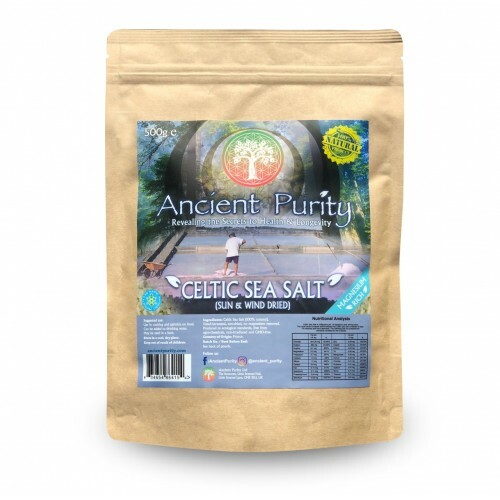 It is extracted from the earth by a process known as solution mining, and it is globally the most coveted source of naturally occurring magnesium chloride in existence. Q - Should I continue using other Magnesium supplements orally if I am also using Magnesium topically? A - This is a matter of personal choice, often dependent on how well or how poorly each individual tolerates oral supplements. Topical magnesium represents a welcome alternative for those who prefer to avoid the inconvenience of taking pills, who experience loose stools, diarrhoea or GI upset when taking oral supplements. For those who do have limited tolerance, our Magnesium Spray & bath pack provides much needed additional magnesium without side effects. Q - I have heard that topical Magnesium is beneficial for skin conditions such as psoriasis and eczema? A - This is correct. Magnesium products are highly therapeutic and healing to skin conditions such as Psoriasis, Eczema, Dermatitis, Acne, Poison oak, etc. Topically applied magnesium chloride enhances skin barrier function, decreases inflammation, speeds wound healing, and augments skin cell hydration. However, if you have broken skin or a large portion of your body is affected, it is advised to begin your healing regimen with magnesium baths until the skin has had a chance to start healing and become less sensitive to the high concentration of Magnesium Spray. Q - Are Magnesium products safe for animals and pets? A - Yes, topical magnesium products are just as effective on animals and pets as they are on humans. Many natural and alternative veterinary clinics around the world use Magnesium oil for everything from wound care to general health maintenance. 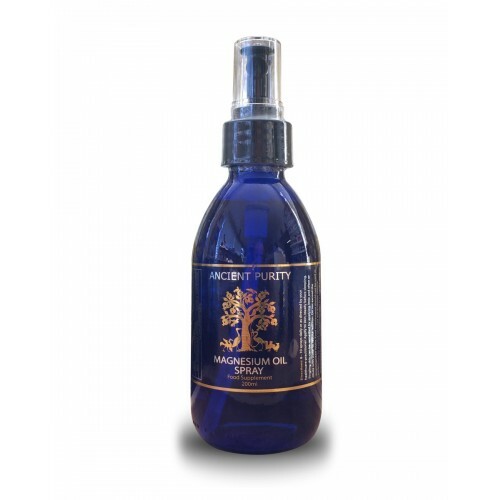 Q - Is your Magnesium “Oil” Spray actually oil? A - Although this is a common misconception. Magnesium “oil” is a term that was coined early in the development of transdermal magnesium therapy. It refers to the hygroscopic nature (attracts water molecules) of a highly saturated solution of magnesium chloride in water along with other trace elements. This super-saturated solution happens to present itself in an oil-like texture and lends itself particularly to absorption via the skin. Q - Is topical magnesium beneficial for detoxification? A - Magnesium is not only beneficial but also essential! 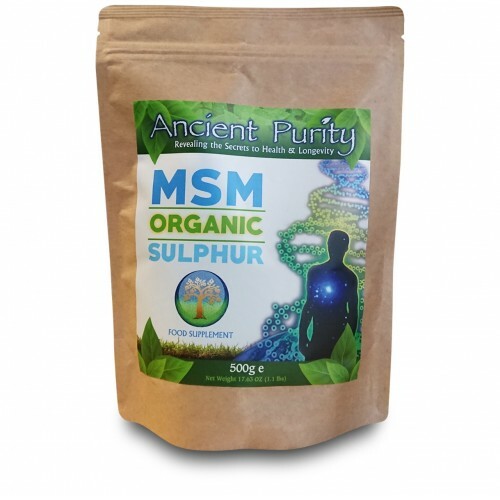 The body utilises alkaline minerals such as magnesium to process cellular debris and counteract elevated uric acid production when combating a detox reaction. In addition, if there is not an adequate amount of magnesium for combating the detox reaction, it will remove the magnesium from the bones and body for this purpose. Studies have shown that magnesium is one of the most commonly deficient nutrients in the chemically toxic individual. People who tend to retain chemical and heavy metal toxins were observed to excrete a high amount of magnesium in their urine, and have problems maintaining adequate magnesium levels. Most importantly, magnesium shields our cells from heavy metals such as aluminium, mercury, lead, cadmium, beryllium and nickel, which explains why we so desperately need magnesium for heavy metal detoxification. Magnesium, for the most part, is indispensable for the survival of our cells but takes on additional significance in the age of toxicity where our systems are overrun on a daily basis with heavy metals. There is escalating evidence that low levels of magnesium play a role in the deposition of heavy metals that may have accumulated in brain tissue. In fact, the cause and solution of numerous physical maladies can be as easy as correcting a magnesium deficiency. In addition, many of the difficulties with mercury chelation can be reduced when the subject is administered sufficient magnesium. Most information associated with chelation will tell you that chelating wastes minerals. Yet very little investigation has been done into the critical mineral whose loss cannot be tolerated without unacceptable risk. Magnesium is vital for phase one detoxification and, along with other minerals such as zinc, dislodges toxic heavy metals from the body. The bottom line is that magnesium is a fundamental factor in the natural self-cleansing and detoxification responses of the body. According to Doctor Frederica P. Perera, Professor of Environmental Health Sciences and Director of the Columbia Center for Children’s Environmental Health, there is a 500-fold difference in the ability of each person to detoxify the same exact toxin. One of the main indicators is each individual’s level of magnesium. For these reasons, the use of magnesium oil and magnesium flakes provides the user with a foundational support system for safe and efficient detox. Q - What is the Zechstein Sea? A - The Zechstein Sea occupied the region of what is now the North Sea, plus lowland areas of Britain and the north European plain through Germany and Poland. At times the Zechstein Sea may have connected with the Paleotethys Ocean through southeastern Poland; the point is disputed by researchers.